For each of your activated workers on the adjacent edge of the tile, you may take 1 or 2 cacao fruit from the supply. You put them individually on 1 unoccupied storage space on your village board. 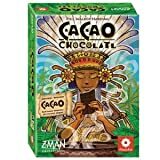 Each player has 5 storage spaces and may never store more than 5 cacao fruits, any additional fruits that you acquire go to waste. For each of your activated workers on the adjacent edge of the tile, you may sell 1 cacao fruit from your storage for 2, 3 or 4 gold. For each of your activated workers on the adjacent edge of the tile, you may take 1 or 2 gold from the bank. For each of your activated workers on the adjacent edge of the tile, you may move the water carrier on your village board 1 water field ahead in a clockwise direction. If the water carrier reaches the water field with the value "16", he stops there. Any possible further steps go to waste. At the end of the game, you add to your gold coins the value of the water field on which your water carrier is standing. If the water carrier is still standing on a field with a negative value, you have to deduct the applicable number. For each of your activated workers on the adjacent edge of the tile, you may take 1 sun token from the supply. You put it on an unoccupied sun-worshiping place on your village board. Each player has 3 sun-worshiping places and may never own more than 3 sun tokens. Sun tokens that you might get beyond that go to waste. Towards the end of the game, you can use sun tokens to "overbuild" one of your own worker tiles. At the end of the game, you get 1 gold from the bank for each sun token you have not used. The temples have no direct effect during the game. Only at the end of the game are the temples scored, individually, one after another. The player who has the most workers adjacent to the respective temple receives 6 gold from the bank. The player with the second most adjacent workers obtains 3 gold. If there is a tie for first place, 6 gold are evenly distributed among the players involved (and rounded down, if necessary). In this case, there is no gold awarded for second place. In case first place is clear but there is a tie for second place, 3 gold are evenly distributed among the players involved (and rounded down, if necessary). Note: If any worker tiles adjacent to the temple have been overbuilt, only the worker tile on top count for the scoring. If there is only 1 player with workers adjacent to the temple, he gets 6 gold from the bank, as usual. No gold is awarded for second place. You need to have at least 1 worker adjacent to the temple in order to score for it. First replace the 3 gold mines with the 3 volcano tiles. Put the gold mines back in the box. For the two-player game only, sort out 1 volcano instead of 1 gold mine with value 1 and put it back in the box. Action: For each of your activated workers, depending on the value indicated on the adjacent edge of the tile, you must take 2 gold from the bank or pay 1 gold to the bank. If you have no gold coins at that moment, you do not have to pay.